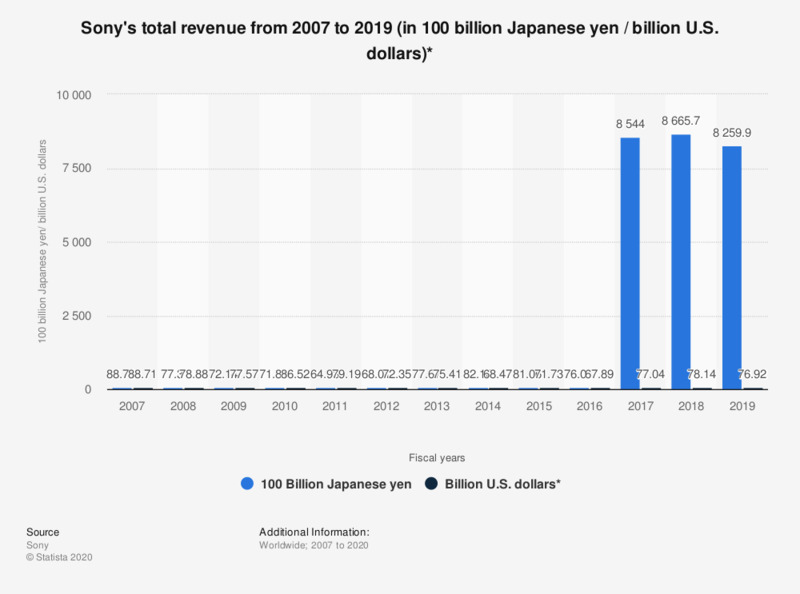 This statistic shows the global revenue earned by Sony between fiscal year 2007 and 2017. In FY2017, Sony recorded revenue of around 77.04 billion U.S. dollars. Founded in 1946 in Tokyo, Japan, Sony Corporation is one of the largest international conglomerates in Japan alongside Panasonic, Hitachi and Toshiba. Sony is responsible for a number of significant innovations, for example the Walkman in 1979. Nowadays its diverse business focuses on electronics, games, financial services and entertainment. In FY2017, the net income of Sony amounted to approximately 461 million U.S. dollars. Sony Mobile Communications, formerly Sony Ericsson Mobile Communications, counts as a leading manufacturer of mobile phones. In FY2017, 8.5 percent of Sony’s sales had been achieved through mobile products and communications. In the field of television, in 2017, Sony had a market share of 5.6 in the global LCD TV market, ranking fifth in the world market. In this segment, Samsung held the largest market share with 20 percent. LG Electronics ranked second place, followed by Chinese electronics company TCL. * Sony's fiscal year ends on March 31. For example, fiscal year 2017 ended on March 31, 2018.